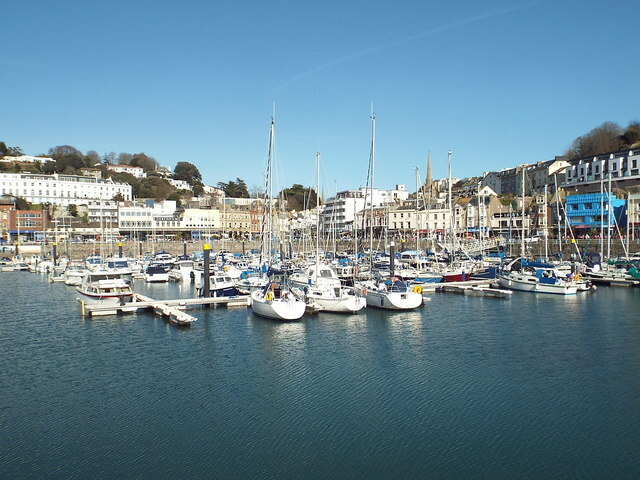 Boats moored in the Old Harbour at Torquay, on a pleasant and sunny Good Friday afternoon. The Grosvenor Hotel in Belgrave Road was previously the Roslin Hall Hotel, and consisted of two late Victorian villas, of similar plan, linked at ground level by a curved corridor lounge housing a cocktail bar. The layout can be seen in the centre panel of this postcard which was produced for the hotel during the 1960s. Another postcard from the early 1970s shows the interior of St Luke's Church which was at the time claimed to be the most colourful in the country.